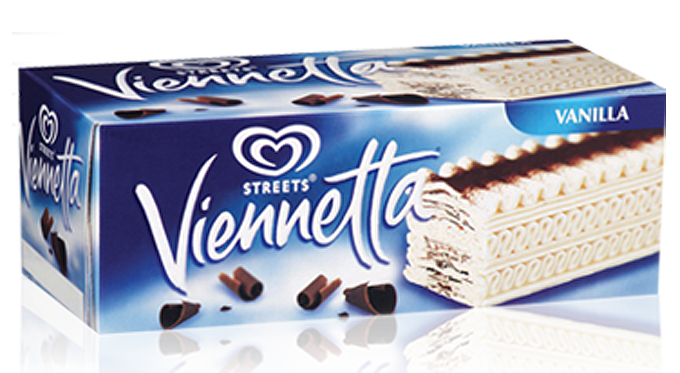 If you are a child of the 80′s and 90′s, you would be familiar with the Viennetta. For those of you who don’t know, it was a pimped-up ice cream cake that you found in the frozen section of the supermarket (refer image below). Us kids who didn’t know any better, victim to cheesy advertising thought it was a bit of a special treat, you’d cut it up in slices and marvel at the layers of vanilla ice cream and chocolate. Somehow, even as a child I was always a bit disappointed when it comes to eating it — it’s airy and lacks substance, and it never quite lives up to the expectation you have of velvety vanilla ice cream with a touch of rich, dark chocolate. I don’t think they make it in the US any more, but I’m pretty sure you can still get it in Australia. 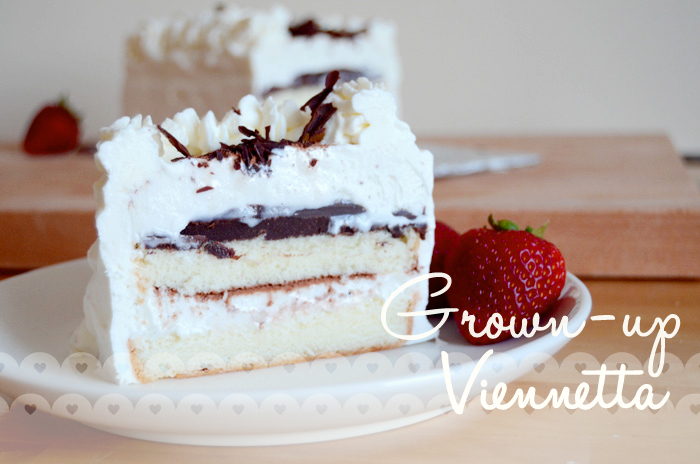 In any case, Vin is a big fan of the Viennetta, and I decided to go about surprising him with a somewhat ‘grown-up’ version of a Viennetta, one that tastes better, made of better ingredients, and with a bit more love than this. With all the chilling in between layers, I would estimate that this took me 5 or so hours – but it was definitely worth it! To mix it up you could add a flavored liqueur in the ganache (like Cointreau); or add some flavor to the whipped cream (coffee cream could be good). Here’s the sketch of my grown-up version. 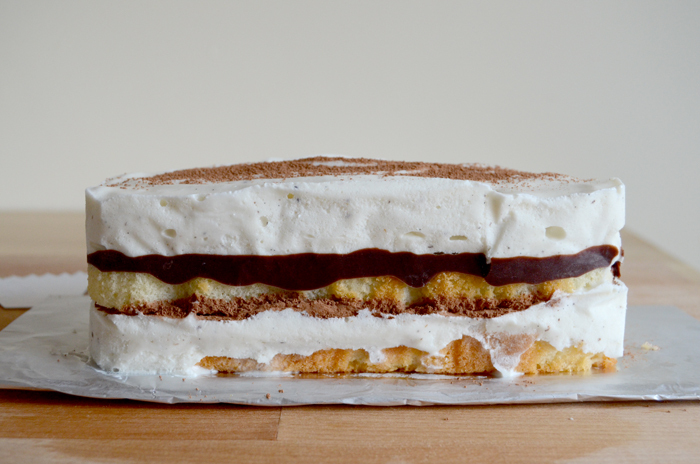 It includes layers of pound cake, vanilla ice cream, chocolate ganache and fresh cream. I have a good reason for not baking the cake; I don’t have any cake moulds yet. So, I used a butter pound cake from the supermarket which worked brilliantly. I really like the texture of frozen cake, something buttery works best. 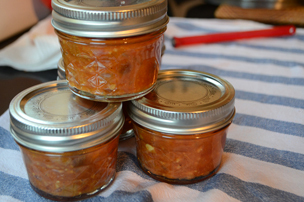 Make sure there is clear shelf room in your freezer; I made this in a hot kitchen and everything was melting under my hands! I didn’t want to defrost the whole tub of ice cream, so I put aside enough for two layers of ice cream (maybe 8-9 scoops) and put it in the fridge to thaw a little. I then went about making the base and the cake sleeve that would hold everything together. If you have a suitable tray or loaf tin, you can skip these steps. I used the box from the cake and covered it with aluminum foil. Put aside the top layer of pound cake if it is not level – and carefully slice two level layers, each about 1cm thick. 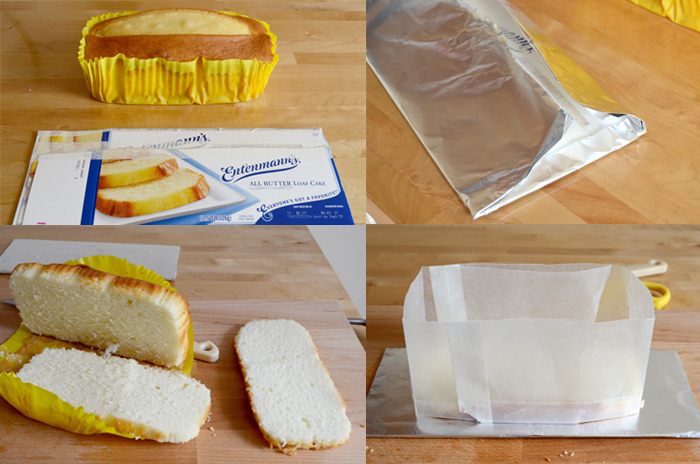 Finally fold a snug rectangular sleeve around one of the cake layers with baking paper and tape it together. 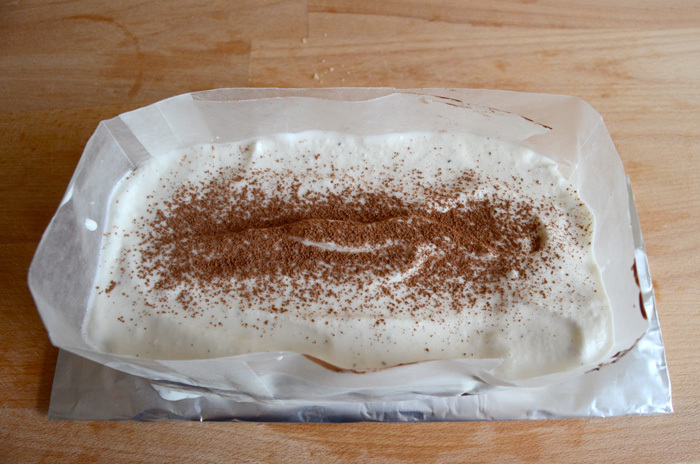 Place the sleeve and both layers of cake in the freezer to chill. 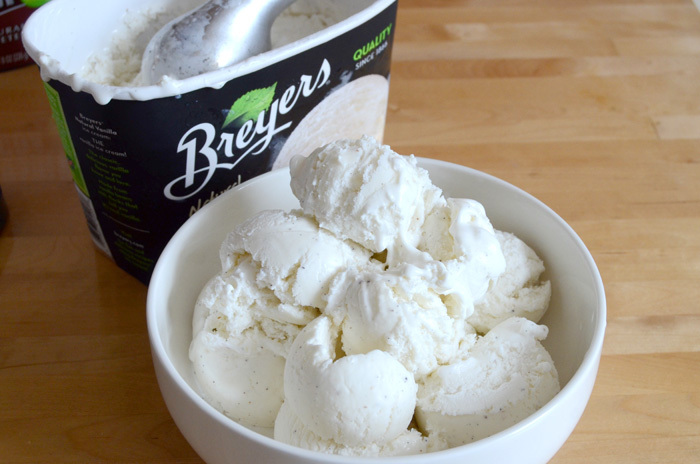 Remove ice cream from the fridge and take out enough in a bowl for the first layer. 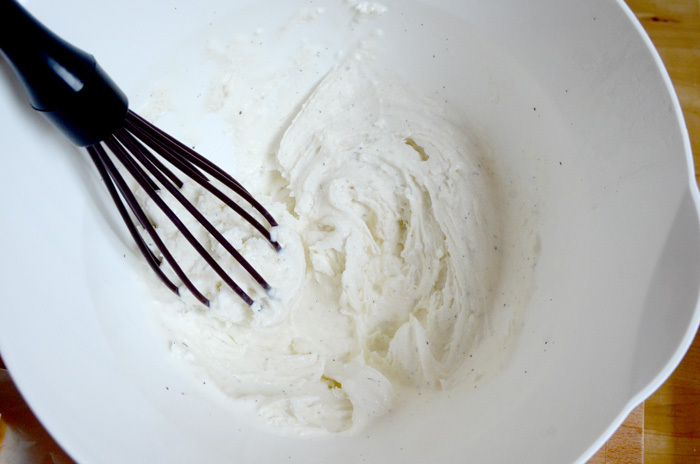 Mix with an egg whisk to get it to a softer, workable consistency. Work quickly as you don’t want it too runny. 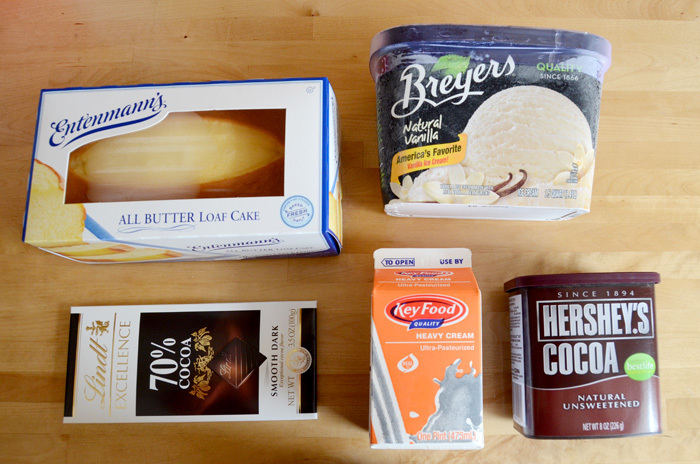 At this point, check on the rest of the ice cream and if it is getting too soft, move it back into the freezer. 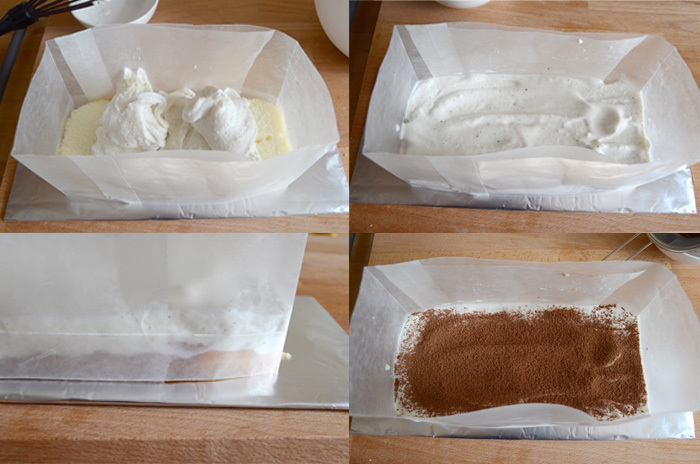 Take out the first cake layer and smooth the first ice cream layer carefully in the sleeve, about 1cm thick. Dust the layer with cocoa, and quickly return the cake to the freezer while you make the ganache. Reserve some chocolate shavings for the top if desired, by running a knife along the back of a cold block of chocolate, and place in the freezer. 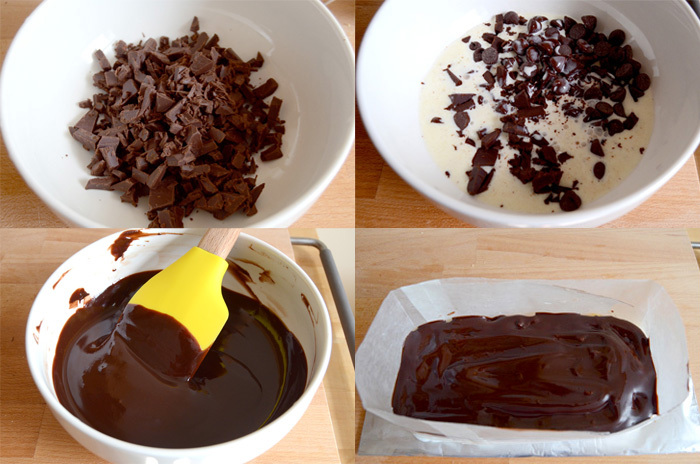 Chop up the rest, approximately 100g of chocolate. Heat 60ml of heavy cream and 1 tbsp of butter in a pan over low heat. Once you see small bubbles around the edge and the cream has just boiled, pour it over the chocolate and let stand for a minute. Add liqueur if desired (I added rum), and stir the mixture until you have a perfectly glossy, smooth ganache. 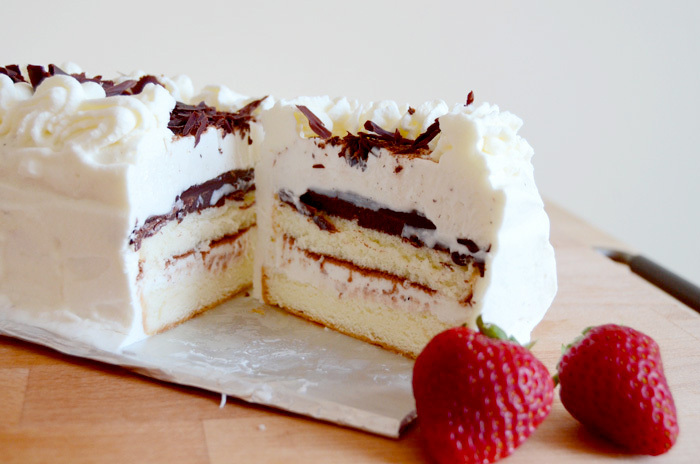 Take the cake out of the freezer, and place the second layer of cake into the sleeve. Spread an even, thin layer (no more than 5mm) of ganache over the cake. Because the cake is chilled, the ganache starts to set as you spread which makes it easy to keep it neat. Pop the cake back in the freezer for at least 30 minutes. If the rest of your vanilla ice cream is in the freezer, it might be a good idea to move it back to the fridge. Now for the final layer of ice cream. Spread a generous amount of vanilla ice cream, improving the shape of the cake by pushing gently on the outside of the sleeve while spreading the ice cream inside with a small spatula. Dust a little more cocoa carefully just along the center. The cake needs to be completely frozen for the last part, so leave it in the freezer for at least three hours. 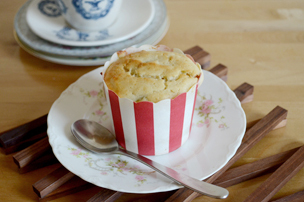 Once you are happy that the cake is completely solid, remove the sleeve or loaf tin. The layers are pretty level, but I would suggest making the ganache thinner than what I did here (it hardens to be quite solid in the freezer!) 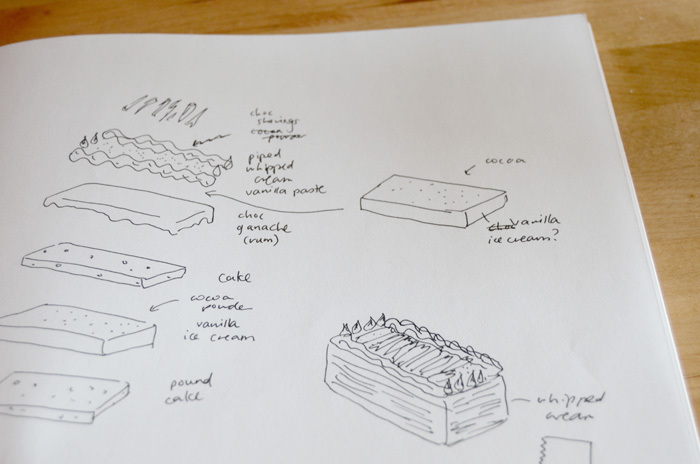 and maybe even do two layers of ganache, one after the first layer of cake. Any left over ganache can be made into truffles, simply leave in the fridge to set for a few hours, then spoon, roll and coat in cocoa powder. 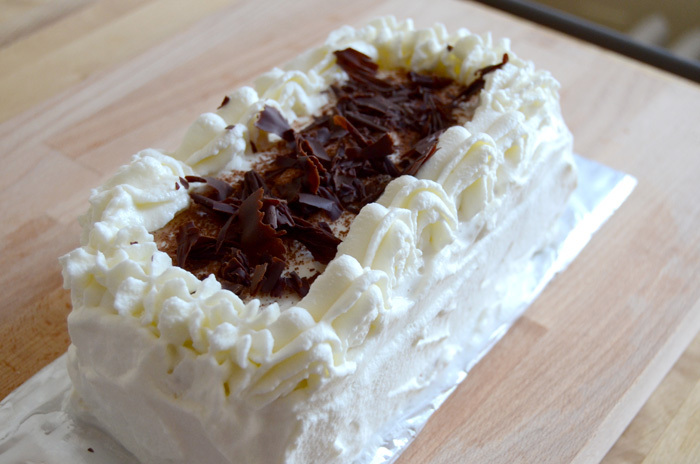 The best part is decorating this ice cream cake to look like a Viennetta. Whip the fresh cream with the caster sugar to a stiff peak. 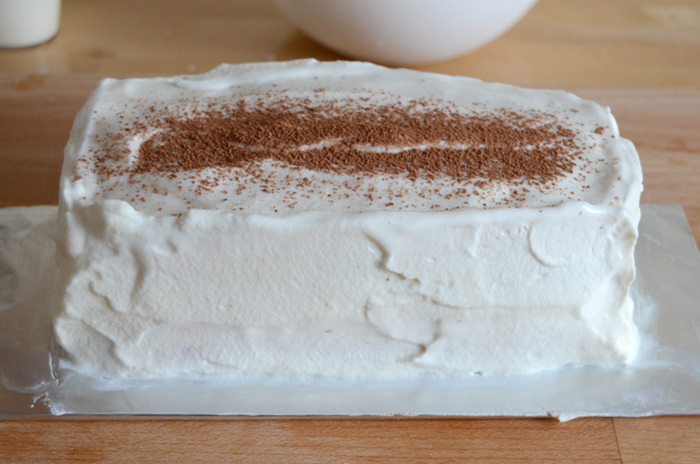 Use a palette knife or spatula to cover up the sides, adding cream where needed to make a nice rectangular shape. Use a piping bag and star-shaped tip to make some waves along the long edges and stars on the short edges. Sprinkle chocolate shavings on the top, to add that special touch. Now hurry it back into the freezer before the ice cream starts to melt out. The cake slices straight out of the freezer, for a decadent and luxurious-feeling dessert that (if you’re lucky) will last you a week!